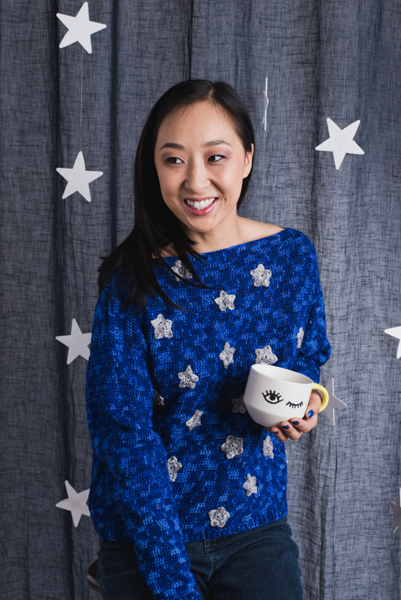 This comfortable lightweight sweater is perfect for those late summer nights that are slowly turning into chilly fall weather. 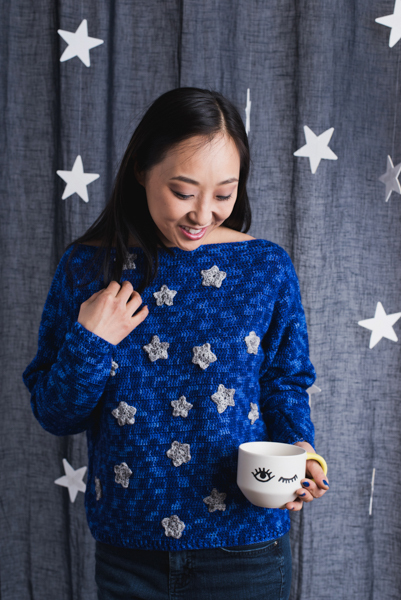 Featuring cute little crocheted stars, this sweater is for those free spirits that want to wear something fun and edgy. Hook: US size C/2 (2.75 mm) or size to obtain gauge. 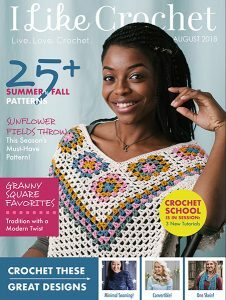 This pattern is worked flat with 4 main pieces (front, back, and 2 sleeves). 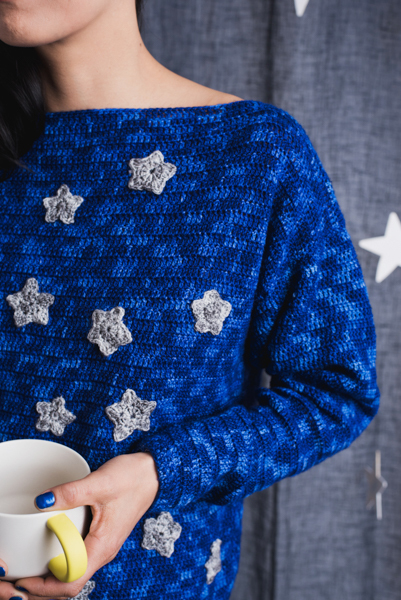 Stars are created separately and then stitched over front piece before sewing all 4 pieces together. Ch 3 counts as first dc throughout the pattern. With MC, ch 105 (115, 125, 137, 147, 159, 169, 179). Row 2: Ch 3, *fpdc, bpdc; rep from * to last st, dc on last st (top of turning ch). Row 3: Ch 3, *bpdc, fpdc; rep from * to last st, dc on last st (top of turning ch). Row 4: Ch 3, dc in each st to end of row. Rep Row 4, until piece meas 22 (22, 23, 23, 24, 24, 25, 25)”. Rep instructions for Back piece. With MC, ch 45 (49, 55, 63, 63, 69, 69, 73). Rep Rows 4-5, 22 (22, 22, 21, 24, 23, 26, 27) more times. 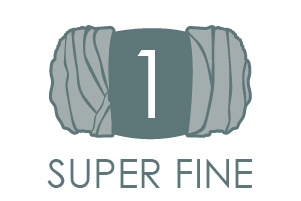 (89 (93, 99, 105, 111, 115, 121, 127) sts). Rep instructions for second Sleeve. With CC, make a magic ring. Fasten off. 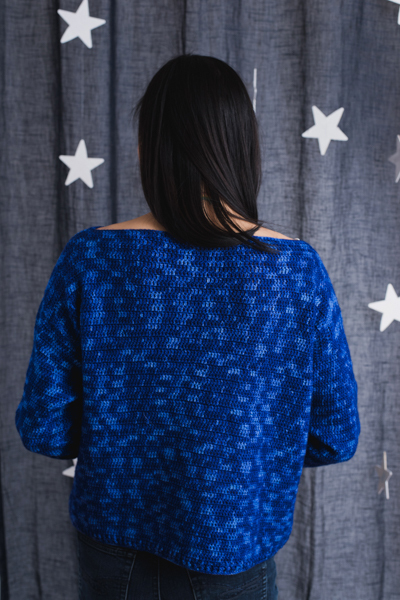 Leave a long tail of yarn to use when stitching it over Front of Sweater. Wet block all pieces to measurement. When blocking stars, stretch from all 5 points to create desired look. 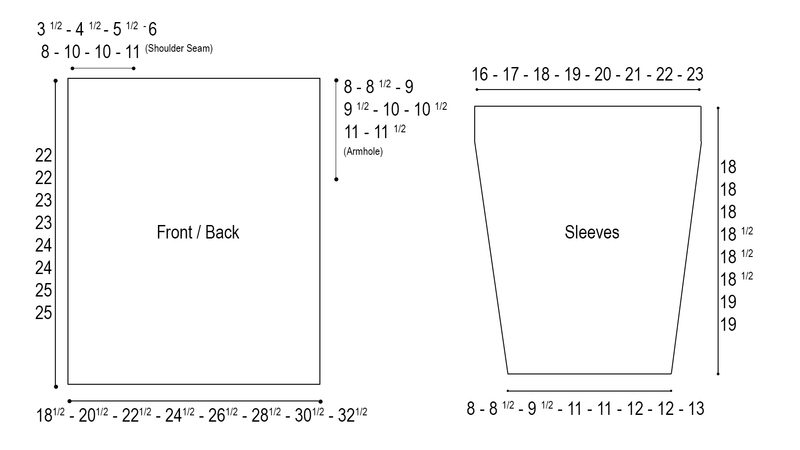 Sew shoulder seams as shown in diagram, 3.5 (4.5, 5.5, 6. 8, 10, 10, 11)” from Armhole edge. Sew sides from bottom to top, leaving a space for Armhole that is 8 (8.5, 9, 9.5, 10, 10.5, 11, 11.5)” wide at the top.